A couple of weeks ago an email popped into my inbox asking if I'd like to try a Dr. PAWPAW Multipurpose soothing balm and I jumped at the chance. I've seen pictures of the little yellow, pink and peach tubes floating around on the interweb and have been curious about them but haven't got round to checking out what they were. 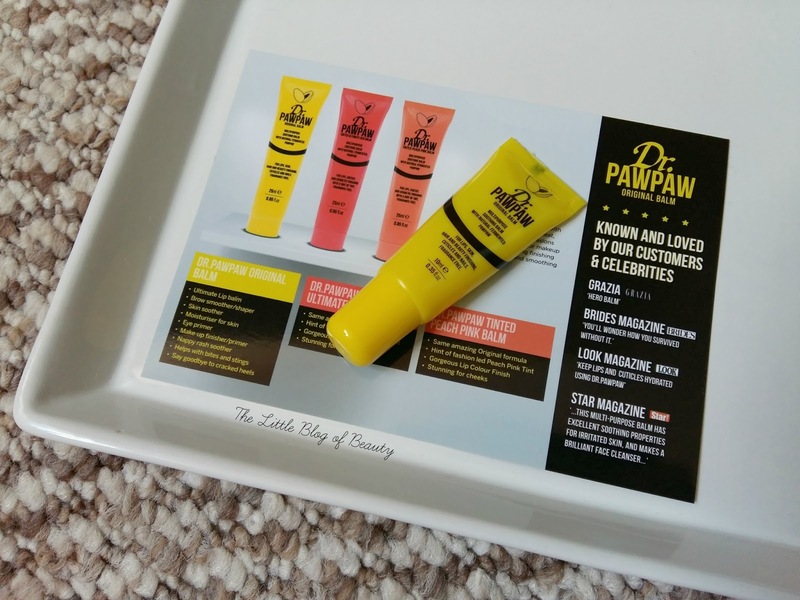 I was sent the Dr. PAWPAW Original Multipurpose soothing balm* (yellow tube) but this is also available in a tinted red balm (pink tube) and tinted peach balm (peach tube). The tinted versions are intended for the lips but can also be used on the cheeks to add a hint of red or peach flush. I obviously haven't tried these ones so I can't comment on what either one looks like or how they feel to apply or wear on the cheeks. The original version that I have is clear and can be used as a lip balm, skin soother (including nappy rash), moisturiser, brow smoother, for bites and stings, for cracked heels, as an eye primer and makeup finisher/primer. The balm contains just five ingredients but the first one is petrolatum or petroleum jelly. I'm aware some people aren't keen on this as an ingredient as I believe it's not absorbed by the skin, so doesn't provide moisturisation, but it does create a barrier to reduce moisture loss. However the second ingredient is aloe barodenis (aloe vera) leaf juice and I'm personally a big fan of this for it's skin soothing and healing properties. This in itself is a very multi-use product. The final three ingredients are olea europaea (olive) fruit oil, carica papaya (fermented PAWPAW - obviously where the name of the product originates from) and potassium sorbate. Potassium sorbate is a product that is often used in place of parabens as a preservative to inhibit the development of micro-organisms. Initially this appears like a lanolin based product and is quite difficult to squeeze out of the tube it it's cold. You either need to just give it a really good squeeze or warm it up a little, but this also means you don't want it to get too warm or it will melt. It dispenses as a solid balm but starts to soften once on your finger and then once placed on your skin immediately melts down to an almost water like feel. Since I received this I've used it as a lip balm and a nail and cuticle balm and I love it. It instantly soothes my lips and makes them more comfortable and helps keep my cuticles and the skin around my nails supple and moisturised. I can see this working on dry skin, although I think it would work better on just dry rather than cracked heels, but I'm not entirely convinced about using this with makeup. Although you can't see it, it feels like some of it does sit on the skin for a while and I wouldn't be happy to apply makeup over the top of it. But other than that I'm a big fan and I'm planning to pick up the red version which I'll be popping in my handbag for a hint of tint and lip care on the go. Prices appear to vary very slightly (as in 4p!) but this is available on the Dr. PAWPAW website, from Harvey Nichols, Urban Outfitters and ASOS. A 25ml tube is £6.95 but if you want to use this on a bigger scale you can also get 200ml for £29.99. Have you tried Dr. PAWPAW?